The USA KIA/DOW Family Foundation (USAKIA), based in Mountain View, California, is an IRS-approved, tax-deductible and tax-exempt nonprofit. KIA families incorporated the 501(c)(3) organization in the fall of 2003 to benefit families of those killed in action (KIA) and died of wounds (DOW) while in the U.S. armed forces. Current projects include memorial events, membership, and free flag and art programs for KIA and DOW families. After USAKIA incorporated in 2003, the nonprofit received official tax-exempt and tax-deductible status from the IRS in 2004. Final determination of USAKIA by the IRS as an organization that is tax deductible and tax exempt occurred in 2008. See the final-determination letter in PDF format for more information (requires Adobe Acrobat Reader). USAKIA also has a store with products honoring U.S. KIA. America Remembers KIA allows USAKIA the use of its trademarked KIA flag and symbol. All donations are tax deductible. 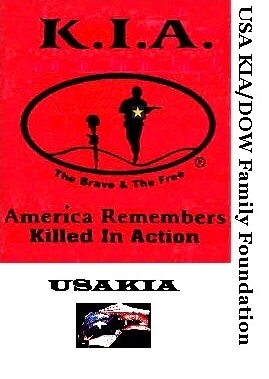 The USA KIA/DOW Family Foundation (USAKIA) is here to increase ability to demonstrate the strength of families with killed in action (KIA) or died of wounds (DOW) while in our U.S. Armed Forces. KIA family and public support through USAKIA programs such as membership, memorials, and direct support to KIA families will honor their memory, show gratitude, and provide America with social justice. We are there for the whole family, and we are also a unique organization begun by KIA family members, for USA KIA family members, and for us, every day is Memorial Day. "All gave some... Some gave all."